My experience with cortisone shots begins with a little story about my skin. I grew up having nearly perfect skin. Don’t get me wrong, I would get the occasional pimple, but nothing my trusty Mario Badescu Drying Lotion ($17) couldn’t handle. Then, suddenly something changed. As I about to turn 20, my skin turned on me. To this day, I don’t know what sparked it (I’m going to blame hormones, although not the point), but my skin erupted with cystic acne. I’m talking big, deep, painful, recurring cysts. Here I was thinking I had escaped my teenaged years acne-free and moved onto life as a clear-skinned adult. Deep sigh. So, as someone who has always been diligent about skincare, I freaked out, naturally. In this type of situation you either call your mom or your dermatologist. I did both. The latter led me down a path I would eventually regret. 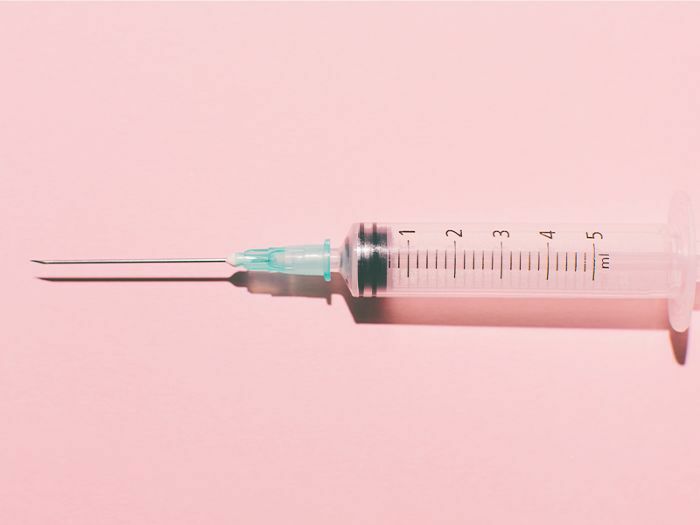 Keep reading to hear about my experience with cortisone shots—and everything I wish I had known. You may or may not have heard of cortisone shots being used to treat acne, but basically it works like magic. In a procedure called intralesional corticosteroid injection (known on the street as a steroid shot, cortisone shot, or cyst injection), a dermatologist will inject a diluted corticosteroid directly into your papule, nodule, or cyst (aka your zit). Within a few hours. your pimple will start to go down. Within 24 hours it will all but disappear completely. Your doctor may numb the area before the injection, but either way it’s relatively painless. Your doctor also may or may not drain the sebum from the pimple before injecting it. The whole procedure takes about 15 seconds in all, you leave with a little Band-Aid on the injection site, and you wake up nearly 100% pimple-free in the morning—like magic. Sounds pretty great, right? There are some caveats. For most people, cortisone shots are considered the last resort—what you do when you’ve fought with the same stubborn zit for months. Or a quick fix you turn to if you wake up with an unsightly blemish the day before a big event like your wedding. For me, it was a panicked solution when I woke up with something I can only describe as monstrous. I had never experienced a breakout of this magnitude, so I immediately turned to a professional. My dermatologist assessed the situation and said I was pretty much a textbook example of why someone would need a cortisone shot. (Yes, it had only been a few hours since my pimple appeared—not a few months—but it really was massive and painful.) So with a little pinch of the needle, I did it. Then he explained that some people will notice a “sunken appearance” where the pimple used to be, but that it usually fades away within a few weeks. In some cases, it can take several months. In other cases, that depression can become a permanent scar—which is where my story is headed. The shot worked like a dream. I was ready to show my face in public again by evening. My cortisone injection experience started with just that one enormous cyst that sent me running to the nearest dermatologist. However, it didn’t end there. Like I said, my skin never caused me any real problems up until that point. Then, I had cystic acne springing up on my chin and nose regularly. This is where I wish someone, perhaps my doctor, would have stepped in with another solution. I wasn’t getting every blemish that surfaced injected, but my trips to the dermatologist were not infrequent either. Again, cortisone shots are meant to the emergency solution, not a regular treatment. But once you’ve watched a pimple disappear before your eyes, it’s hard to go back to waiting it out for weeks. The main reason I wish my doctor would have been more conservative with his cortisone is because my flare-ups were all pretty localized around the same two areas: my nose and my chin. And while I was warned about the possible skin depressions, I didn’t do my research as thoroughly as I should have. If I had, I would have found numerous sources that point out that too much cortisone or too strong of a dilution is what causes the pitting. Considering I often had two or three cysts on one side of my nose, filling them all up with cortisone probably wasn’t the wisest choice. You would think that’s something a doctor would caution against, but that didn’t happen for me. Eventually I weaned myself off of injections (and found a new dermatologist too). For months, I patiently waited for the depressions to disappear. Years later, I’m still waiting. I have a few little pits, or ice pick scars, on my chin and on one side of my nose. On the other side of my nose, I have a small collection of boxcar scars. Boxcar scars are defined as “depressed acne scars, round or oval in shape with steeply angled sides.” I prefer to call them “swimming pool” scars because I think it both accurately describes their appearance and because it sounds more pleasant. Luckily, my major “swimming pools” are on the side of my nose and most people probably don’t notice them unless up-close. But I notice them. Every day. No amount of exfoliation or retinol has been able to help. And every time a professional looks at my skin, they ask what happened, and when I tell them the reaction is always the same: a sigh and a knowing head shake. I’m still exploring my options and hopefully I’ll be able to report back with a happy ending to my story (more to come on that front). But for now, I’m just staying far away from needles. Have you ever had a cortisone injection? Share your story in the comments below. This story was originally published on January 26, 2015, and has been updated.